“The artists who have created and visualized this world developed their imaginative creativity with such fertile cultural elements as Star Wars, Blade Runner, Aliens, Tron, and The Terminator to name but a few of individual inspirations. From the bucolic to the terrifying, these artists all share a common sense of exhilaration that is the signature characteristic of genuine creative facility.” –Syd Mead, visual futurist. 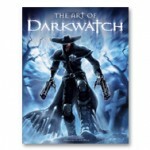 The Art of Darkwatch book showcases the concept art that went into creating the video game, Darkwatch. It demonstrates the process and development of the concepts, as well as the evolution of the game itself. Steal a glimpse into the true talent, perseverance, and collaborative spirit of the concept artists that contributed to developing Darkwatch. Categories: Books, sorry you missed us // out of print. Tag: darkwatch.